Springfield, MA. Temple Beth El. Facade seen from Dickenson St, with Ibram Lassaw's "Pillar of Fire." Photo: Samuel D. Gruber 2011. Springfield, MA. Temple Beth El. Sanctuary. Photo: Samuel D. Gruber 2012. (ISJM) As part of its centennial celebration, Temple Beth El in Springfield, Massachusetts has organized a half day symposium about the architectural legacy of Percival Goodman and the art and architecture of Temple Beth El. The synagogue is Western Massachusetts’ largest Conservative Jewish congregation. The event, scheduled for Sunday, October 27 at 1:30 p.m. at the synagogue, 979 Dickinson Street, Springfield, will feature a tour of the building and its art, a panel discussion led by several noteworthy scholars of the art and architecture community, and a wine and cheese reception. I am happy to be included as the keynote speaker and I'll be giving an illustrated talk on "Percival Goodman, Temple Beth El and the Modern Synagogue." Afterward, I'll be join in a panel moderated by Rabbi Amy Wallk Katz with P. Scott Cohen, Chair and Professor of Architecture at Harvard University, and designer of the Tel Aviv Museum and Suzanne O'Keefe, AIA, who was a student and colleague of Percival Goodman at Columbia University, and a longtime family friend. The event is free and open to the public, however, reservations are required. Please call the Temple Office at 413-733-4149, or e-mail office@tbespringfield.org. Springfield, MA. Temple Beth El. Sanctuary. The windows connect with outdoor nature. Photo: Samuel D. Gruber 2012. Goodman built Beth El twice - first in 1953, and then again in the mid-1960s, after a fire devastated the first building in October 1965. These two dates bracket Goodman's most productive and innovative work as a synagogue designer. From the late 1940s through the 1970s Goodman was the most prolific and most respected American synagogue architect. His influence on Jewish and all religious art and architecture has been felt worldwide (for example, in the work of German architect Alfred Jacoby). Now, a half-century after many of his synagogues were first built they are being reconsidered for practical, liturgical, aesthetic and historic reasons. Springfield, MA. Temple Beth El. Entrance "portico." Photo: Samuel D. Gruber 2011. The jury is mixed - most congregations (Providence, Albany, Springfield, Denver, etc.) still love their Goodman buildings and have or are presently engaged in treating them with respect and making sensitive adjustments. 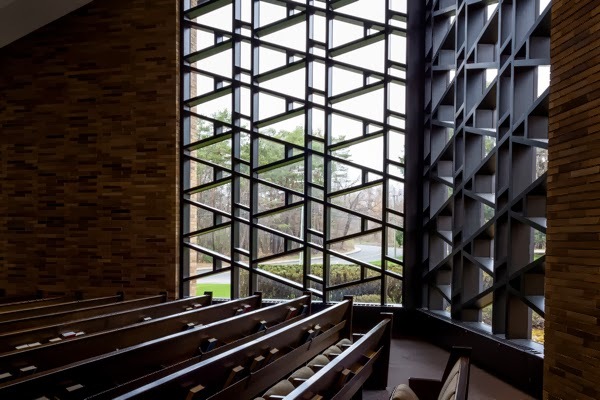 Some others have disparaged Goodman's work wholesale and reject what has now been dubbed "mid-century modernism" as sterile and off-putting on the one hand, or too ostentatious on the other (I've heard both complaints from clergy and congregants). But Goodman's building have fared better than most of the period for several reasons. Though innovative in theor often-expressive architectural design, Goodman's synagogues have a reputation for working well for congregations. As worship spaces and as larger functioning community complexes they are flexible and relatively easy to adjust as needs change. His sanctuaries - when kept clean and bright -can provide both inspiration and delight. Most are shaped in a way to enfold the congregation, thus allowing - with a good leadership - a sense of belonging to a community. Goodman also was master of using relatively simple and inexpensive building materials and mostly straight-forward construction methods. The upkeep of these buildings has been more manageable than for some of the more wildly expressive synagogues of the period (yes, I know, Goodman synagogues sometimes have leaky roofs, too). Goodman was also an active writer about many aspects of community and architectural planning, and a designer of many types of (mostly urban) environments, but he especially left quite a legacy in synagogue design. So many aspects now accepted as parts of the modern architectural vocabulary for religious and other public buildings were invented, developed or refined by Goodman - it is hard to begin the list. On aspect - very noticeable at Springfield - is the inclusion of expressive artwork by modern, mostly abstract, artists (Lassaw, Gottlieb and Motherwell at Springfield). The Springfield commission was especially important for Ibram Lassaw's career. It was his first architectural and functional sculpture, and it helped established his reputation in the 1950s when the work was widely shown and publicized. At Springfield and other Goodman synagogues (Millburn, Beechwood, St. Paul, etc. ), the fate of modern synagogue art has varied; some destroyed, some restored and some compromised by rearrangement or the jarring juxtaposition of new art and architectural elements. I'll address all these themes - and others - in my talk.